IDC/Games, ücretsiz online MMO oyunları. MMORPG,MOBA, RTS... gibi alanlardaki en iyi multiplayer oyunlar burada. Daha fazla beklemeyin ve hemen ücretsiz olarak oynamaya başlayın! Spellweaver, Magic: The Gathering turnuvasının kazananları tarafından tasarlanmıştır. Kahraman kartlarında yetenek kişiselleştirme ve 6 farklı tarzda kart gibi yeni konseptlere sahiptir. Materyal uzmanları tarafından geliştirilen yeni TCG türünde bir kart oyunudur. 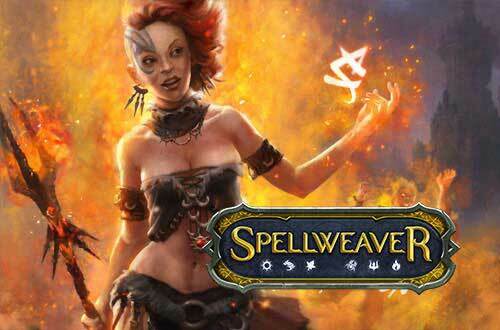 Spellweaver, by Dream Reactor, is a fast-paced and strategically deep digital card game, featuring several mechanics unique to the genre. Created by an indie team of seasoned game developers, and designed by a Magic: the Gathering National Champion, it is easy to learn, yet challenging for veteran card game players. In the course of a Spellweaver duel, your hero gains levels, increases his or her available mana, and even gains new hero skills by using special cards called shrines. It was made sure that the spell-casting hero leading your armies into battle is a central part of your strategy. In Spellweaver it is not only brute strength that matters. A creature’s speed attribute determines which other creatures it can attack or block. A creature can only attack other creatures with the same speed or less. The same goes for blocking. This simple rule makes creature speed a deciding factor in combat. While the attack and health of a creature are important, creatures with higher speed are much more versatile. Some creatures are better suited for combat than others. Fortunately, Spellweaver‘s battlefield has a support line, which is protected from attacks. The support line is the perfect position for frail creatures with powerful abilities. But should you need them on the front line, that’s no problem. You are free to move your forces between the front and the support line. So get ready to explore the magic world of Spellweaver and dominate the six magical aspects – Order, Wisdom, Nature, Corruption, Dominion, and Rage. You can base your deck’s strategy on one of Spellweaver‘s alternative win conditions. If you manage to reach 40 life, or your opponent’s deck has no cards left, you instantly win the game! And don’t forget to participate in tournaments to win cash prizes! Grafik Kartı: Intel / ATI Radeon X850, 256 MB or better. DirectX 9.0 or higher. Grafik Kartı: nVIDIA GeForce 6800 / ATI Radeon X850, 256 MB or better. DirectX 9.0 or higher. Yükseltme etkinlikleri ve oyun içi indirimler! Sevgililer Günü kutlamaları Titan'da başlıyor! Son haberler ve kampanyalar hakkında bildirim almak istiyor musun?